In order to demonstrate the low memory footprint of Minia, a read contiger built from the GATB-core library, we experienced the implementation of this software on the Raspberry Pi computer. 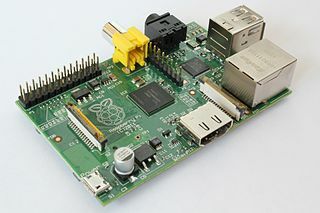 The Raspberry Pi is a credit-card-sized single-board computer including an ARM1176JZF-S 700 MHz processor and 512 megabytes of RAM. Operating system and mass data storage are provided through an SD card. C. elegans (100 Mbp) has been used as a test-bed to assemble 33 millions of 100 bp unfiltered paired-end reads (SRR065390), covering the genome at 64x. Paired-end information was not used. The following table summarizes performances and make a brief comparison with two well known software. G. Collet, G. Rizk, R. Chikhi, D. Lavenier, Minia on Raspberry Pi, assembling a 100 Mbp genome on a Credit Card Sized Computer, Poster at the JOBIM conference, 2013 Jul 1-4 (Toulouse) Best poster award.